The Tab S is a high specification device with a number of USP’s. It is fast and powerful with a fabulous screen. All day battery life of around 10 plus hours. Storage is expandable with a micro sd card for music, photos and documents. The rear camera has a flash unit. It has a fingerprint scanner for a securer mode and an infra red blaster. Touchwiz comes as the default launcher and that also has a magazine UI layout too. It all looks fancy but it slows down the speed of the tablet, so now I use Apex Launcher as you can probably see from the photo above. My setup with Apex Launcher includes Google Now widget, infra red button widgets, and my favourite apps on the single home screen. I have also replaced the Samsung keyboard with Swiftkey which works really well with this tablet. 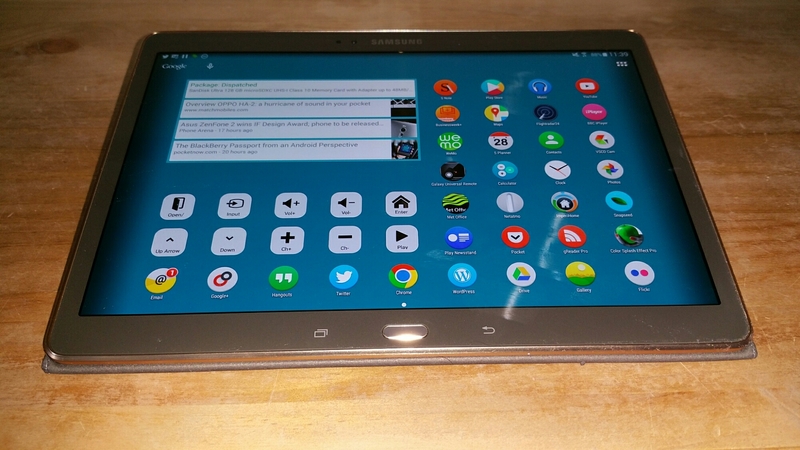 The Tab S is protected by the Samsung cover that also has a typing position and movie viewing too. What is unusual about the cover is that it has 2 studs that push into the back of the tablet, and then when pushed in, click and lock. It is not the easiest of cases to connect, but at least it won’t detach now. The tablet is typical Samsung, with all the bells and whistles included. But what I like is the micro sd card slot for storing all my photos and music, the infra red blaster than I use everyday and the good stereo speakers that also have a decent volume. The audio quality via the headphone socket is excellent. USB Audio is supported too. The 8mp camera comes with the all singing Samsung camera app. Flash is included too. Options include metering modes, touch to capture, ISO from 100 to 800, Night mode, face detection, Full HD Video recording (1080p), Video Stabilisation, effects, timer and location tagging. Shooting modes include Auto, Beauty Face, Shot & More, Panorama, HDR, Dual Camera, Sports, and there are other modes you can download. Camera quality is ok but in anything but good light, noise is present in photos captured. As I have a Samsung Note 4, I use the Samsung Side Sync mode/app. This enables full control of my Note 4 from the Tab S. Pretty cool stuff. I use Wi-Fi Direct a lot between my Note 4 and Samsung Tab S, mainly to transfer photos taken on my Note 4, that are then edited on the Tab S.
The Tab S screen is really fantastic and makes all viewing really pleasurable. The Tab S also has Ultra Power Saving mode, 4 different screen display modes (adaptive, amoled cinema, amoled photo and basic), a reading mode, Toolbox shortcuts, motion controls for mute/pause and palm swipe to capture, blocking mode, private mode, finger scanner, users and profiles (you and setup more than one person to use the Tab S with their own profile), lock screen shortcuts and screen cards. When it comes to multitasking, the Tab S also possesses multi window, allowing 2 apps to be on the screen at the same time. I have had the Tab S about 3 months now and really enjoy using it. It is a powerful tablet that gets loads of use by myself and I cannot see myself changing it anytime soon. I have its little brother, the 8.4, which I love. One question: how easily does the case unattach? You need a little force. It’s not difficult to do just feels odd using so much force to remove.